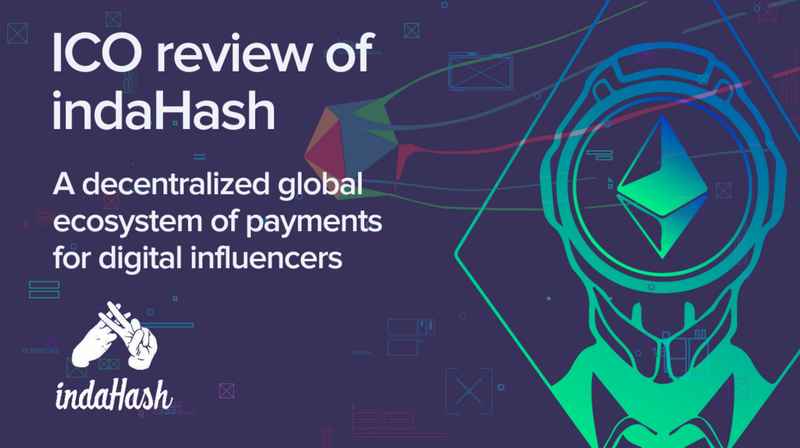 With indaHASH, we continue our line of ICO reviews of projects which have actual working business. Last time I did a review on SNOVIO project, which covered the market niche of leads generation. Another great project with millions of registered users was Sense token. That particular project had a popular chatbot called “sensay.it” which connected people with questions to people with answers. This time we will take a look at ICO, which is connected to a very developed international company with offices all over the world. They occupy the market niche of marketing for brands on social networks. If you see coca cola in the hands of your favorite Instagram persona with viral hashtag, it is highly possible that it was done with the help of indaHASH. So, I installed their app and was fascinated how interesting and easy it is to earn some money if you are a popular Instagram persona. You simply register, confirm your account, pair with a brand, make a post on Instagram and receive money. Due to the fact that my Instagram account had only 10 followers, I wasn’t accepted on indaHash platform. Also, they check if your content is high quality with the help of moderators. What was really exciting is that they already allow so-called “influencers” to withdraw money in ethers. If it is not currently used, still it looks really cool to me. Later you will see why I thought this project was high-quality and why investors could be interested in indaHASH ICO. I am a big supporter of initial coin offerings with established business structure, but you have to be picky when it comes to investing your own money. 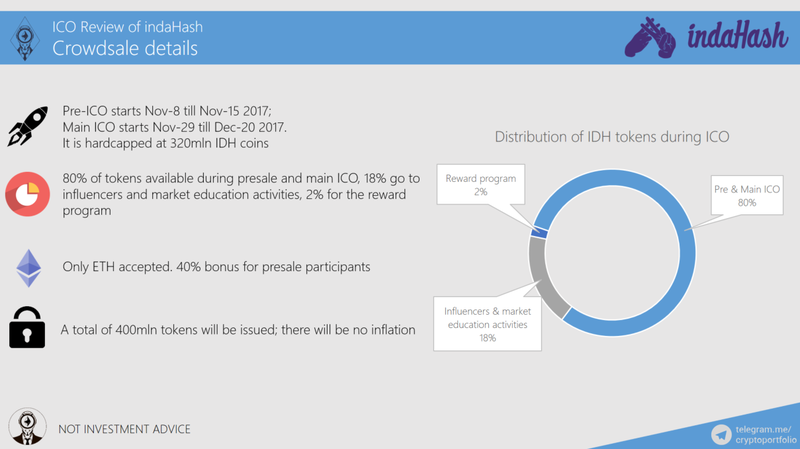 So, I hope I will give you enough information for you to decide if the IDH token economy is attractive and advantages outweigh disadvantages in indaHash project. Let’s see how deep the Instagram ads hole goes. First of all, let me tell you about the team behind this project. IndaHash is a Poland-based company with its first office in Warsaw. The CEO is Barbara Soltysinska. She was a founder of LifeTube, a polish multi-channel youtube network boasting over 43mln active viewers. She sold the company in 2016 to concentrate on indaHash. Also, she was awarded as the Young Entrepreneur of the year 2016 (Ernst & Young). 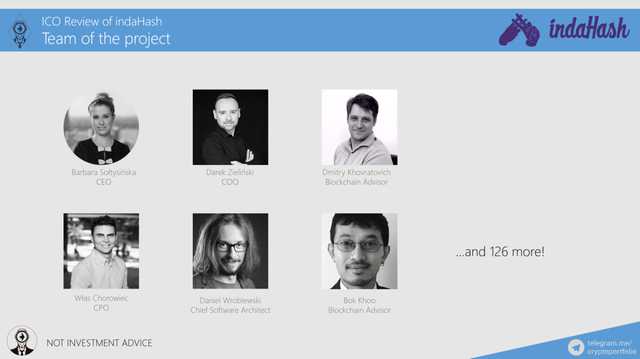 Other team features Darek Zielinski, who is a chief operations officer, responsible for business operations in 70 countries; Włas Chorowiec, who is CPO and responsible for product development, Daniel Wroblewski, who leads the application development process, Dmitry Khovratovich, blockchain advisor, and Bok Khoo, smart contracts auditor. Of course, this is not the whole team, there are over 130 people from 7 countries. This is another advantage of running ICO as an established business, you have a lot of resources at your disposal. Nowadays people are not as naïve as they were at the beginning of development of marketing science and don’t fall for advertisements as easily – most people simply don’t believe what they see in the ads or they just filter out the unnecessary information. But what they still do believe is the opinion of people they know, especially the people they respect or admire. Research by Nielsen.com shows that most of the people (82%) somewhat trust what other people say. But why is it so? It is because people believe the word of mouth is genuine and authentic – as opposed to traditional advertising. These people in our case are called influencers, and the means of marketing that uses influencers is called influencer marketing. In my opinion, this influencer marketing trend truly depreciates the value of people’s opinions on things. Still, Influencer marketing can really be a success ( I personally experienced it and bought advertised products by some Russian bodybuilders) but the quality of advertised products shouldn’t be low. How much time do you think average person spends on social media a day? Almost 2 hours every day! Some people spend even more time (Like me). On Instagram (what interests us the most) average person spends 15 minutes every day, that’s 8 months in a person’s lifetime. Of course, large companies already know about this phenomenon and spend hundreds of thousands of dollars on influencer marketing. Not only this type of marketing is very effective, it is also relatively cheap, in comparison to TV ads. 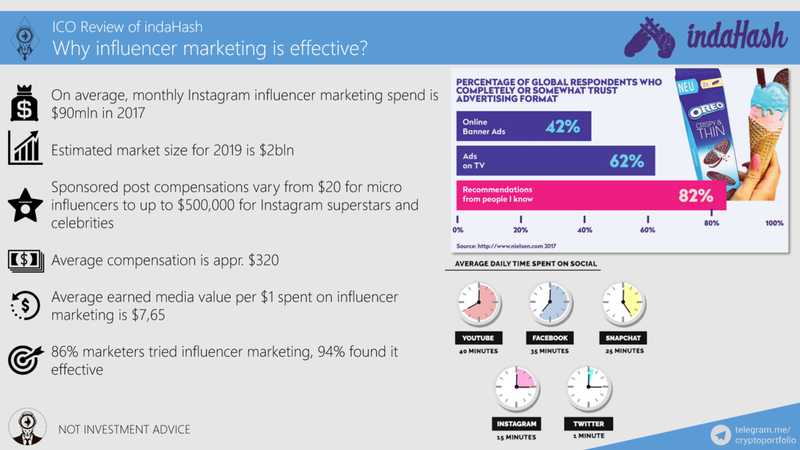 According to the Linqia study, majority (33%) of the companies that do influencer marketing spend $25k-$50k on it, 20% spend $10k-$25k, another 20% $50k-$100k, 1% over $500k, the rest less than $10k. But now, average monthly spend on Instagram influencers among businesses is $90mln every month in 2017, that’s over a billion a year. The market is growing rapidly and estimated market size in 2019 would be approximately $2bln and is projected to reach $5-10bln by 2020. 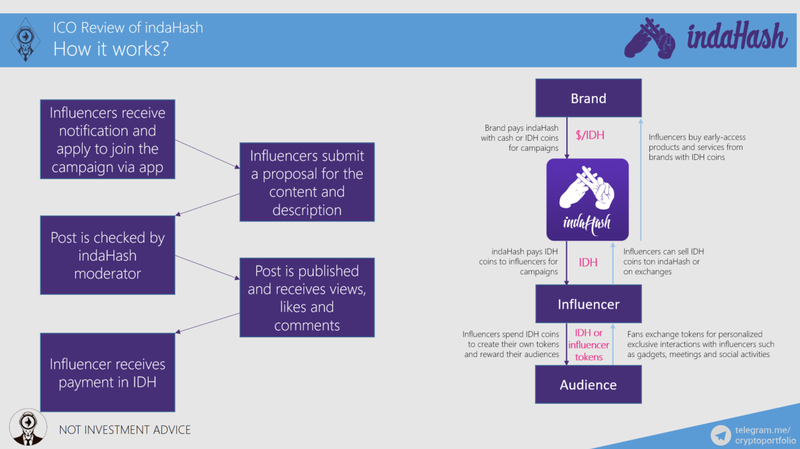 Compensations for sponsored posts vary from $20 for micro influencers (~1000 subscribers) up to $500,000 and more for Instagram superstars and celebrities. Influencer marketing also brings good returns, with average return of $7,65 per every dollar spent on it. 86% of marketers in large organizations already tried influencer marketing and 94% of them found it really effective. 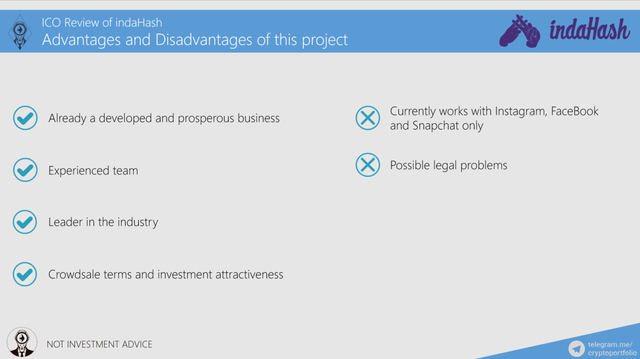 But what is the whole project about? 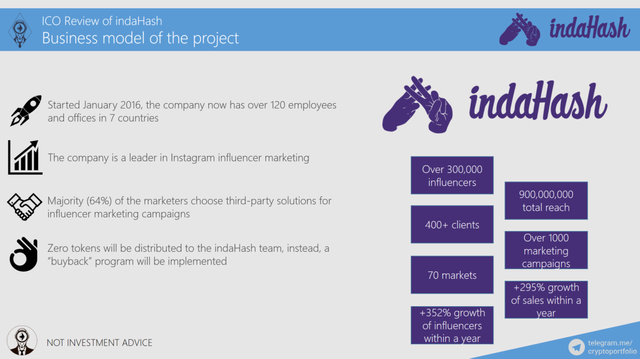 indaHash is currently the biggest international platform for influencer marketing campaigns. It works with Instagram, Facebook and Snapchat and what it does is simply connect influencers with brands through a simple application. As you can see on the screenshot on the right, you can choose a brand you want to pair with. Platform rewards you for making post with the product you choose; the amount of compensation is estimated in accordance with the popularity and coverage of the account. There is also a possibility for influencers to issue their own tokens, which may be used increase their audience engagement. Now let’s see in detail how the whole thing works! But let’s look more precisely into the indahash coin economics here. 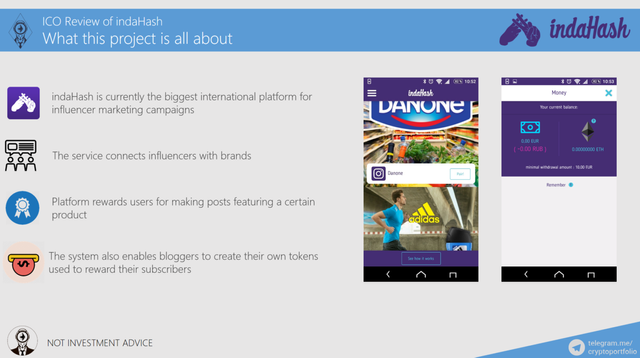 So, we have 4 parties altogether, the brand, indaHash itself, the influencer and its audience. The brand pays indaHash in either regular currencies or in IDH coins (which they can buy from exchages or via indahash itself so they make it easy for them). indaHash then takes those coins and redistributes them between influencers as a compensation from a post. Influencers may sell those coins either back to indaHash through a buyout program or sell them on an exchange (where other brands can buy them). Or, in some cases, influencers may exchange IDH with a brand directly and receive some special offers or early-access products in return. But there is also coin movement between the influencers and their audience. As I stated before, influencers can issue their own currency. These can be used to reward the audience for various activities, and audience, in return, can exchange those tokens for some personalized interactions with their influencers. The company has experienced triple-digit growth. Founded January 2016 it has already become international with offices in 7 countries. The company is officially a world’s leader in Instagram influencer marketing and is now in a really good position. Majority (64%) of the marketers of large and well-known brands tend to choose third-party solutions for influencer marketing – exactly our case. On the right you can see a few numbers about indaHash, they have over 300,000 registered influencers with a total reach of almost a billion users! indaHash has been working with McDonalds, Coca-Cola, Nestle, MasterCard, Samsung, Ford, VolksWagen and so on. Also note that indaHash team keeps none of the tokens to themselves but instead they will implement a buyback program.